Some people spend their life climbing the career ladder and when they get there, they realise it’s not what they want all along. I like to think I have a diversified career portfolio and industry but within the line of communications, branding, marketing and advertising. It’s what I’m good at. But sometimes, doing what you’re good at doesn’t necessarily make you happy. At least I beg to differ. My day job gives me a decent (and steady) income, with employee benefits and of course, EPF. That said, there are times I’m so tempted to throw in the towel and just do what I love – blogging. 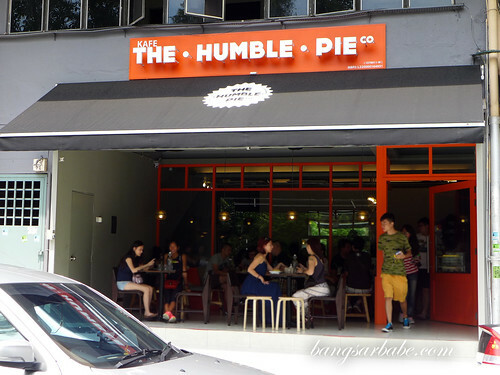 Which makes me salute a former editor I worked for, Eugene Ng, for taking that bold step of leaving his career in publishing and pursuing his dream of owning a café – The Humble Pie Co. in Section 17. 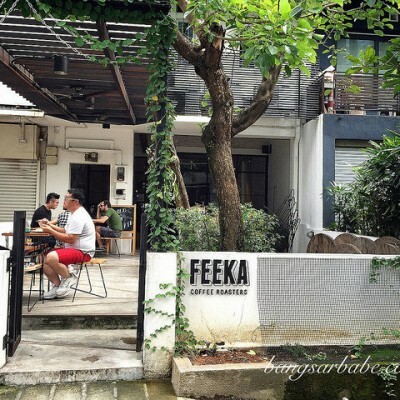 The café is small and cosy, and is known for the banoffee pie and musang king pie. Both happen to be Eugene’s specialty desserts. I’ve tried the former several times, but not the latter as durians and I are not the best of combination. 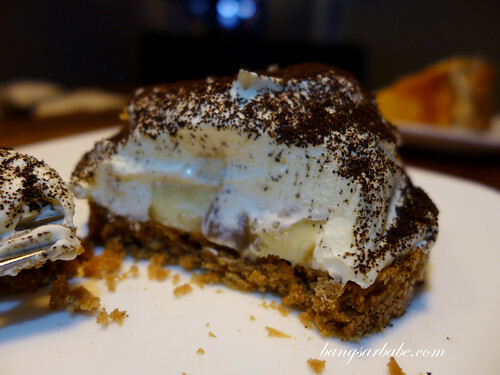 The banoffee pie is pretty good – buttery biscuit base with toffee sauce, banana slices and whipped cream on top. 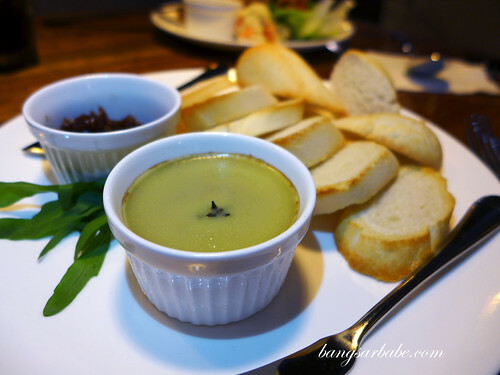 Eugene makes good chicken liver pate, I must say. 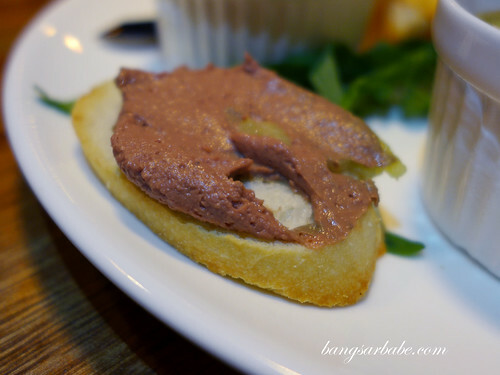 I’m a big fan of pate and would order one whenever I spot in on the menu. 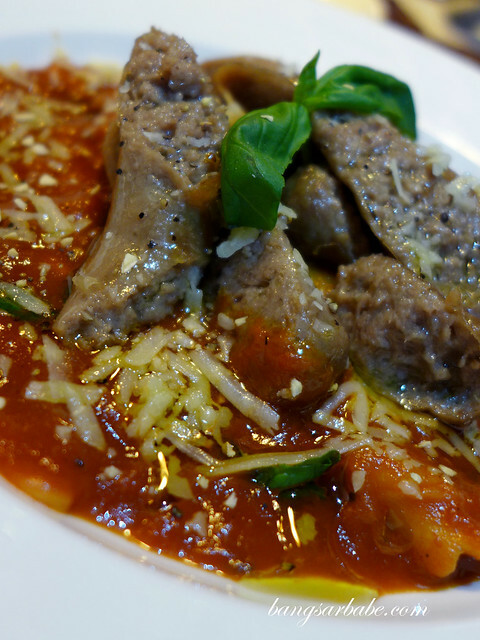 His version was smooth and seasoned, served with slices of bread and onion jam at the side. Good stuff! 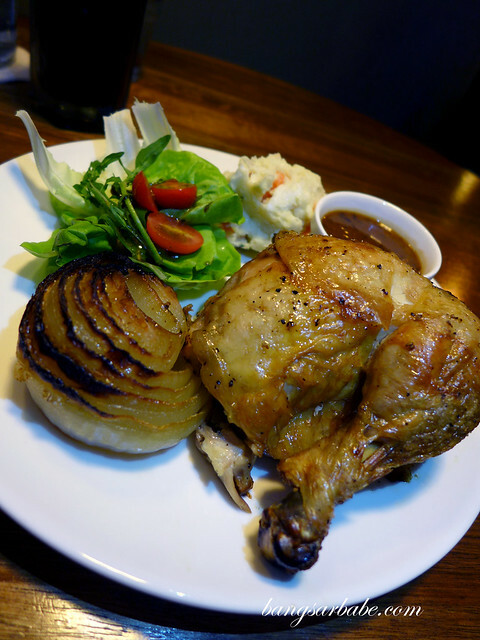 I also tried the roast chicken and pasta – the chicken comes with a side of Japanese potato salad and greens, while the pasta featured pumpkin ravioli with tomato basil sauce and spicy lamb sausages. You can opt to change to beef sausages if you like, but lamb is better in my opinion. 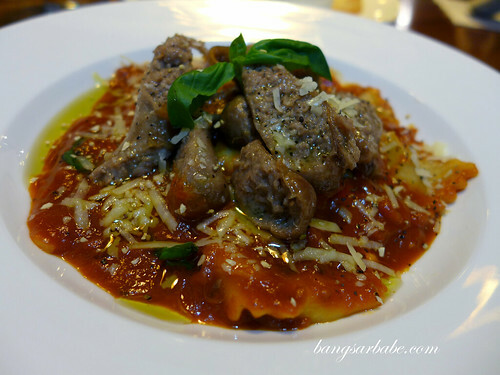 They get their pasta supplies from Bella Luca, so that’s a plus point as I love the fresh pasta from Bella Luca! The chicken was adequately moist and lightly seasoned. That said, it didn’t knock my sock off. If you’re big on roast chicken, give this a try. Otherwise, stick to the the pastas. 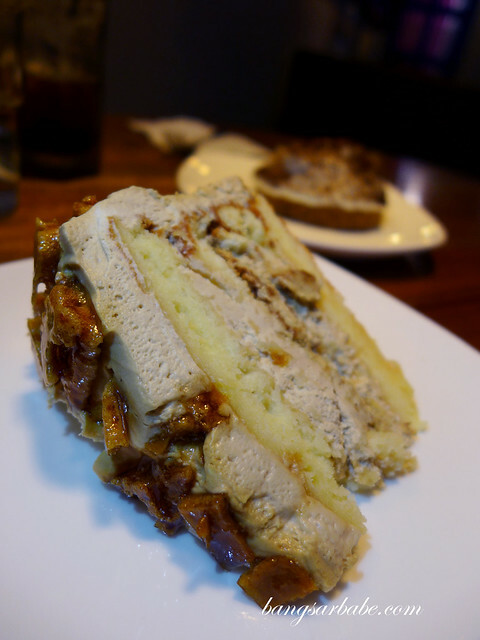 Besides the banoffee pie, I also tried the Honeycomb Coffee Crunch Cake. 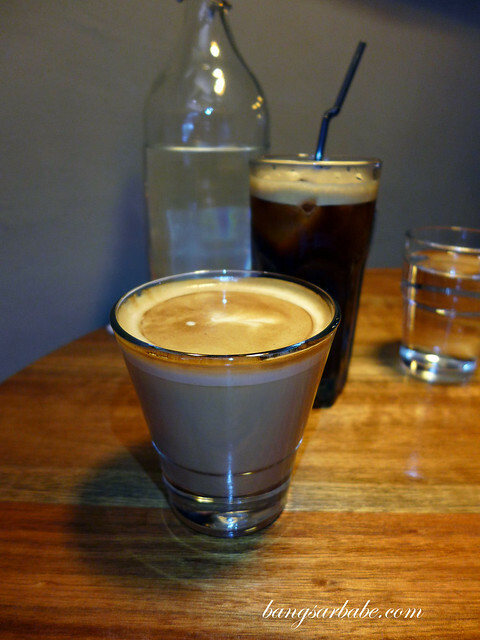 This had a nice balance of textures, and went very well with coffee. The brownie is pretty wicked here, with bits of cranberries for a nicer texture – I didn’t photograph it when I was there previously, but you should give it a try. 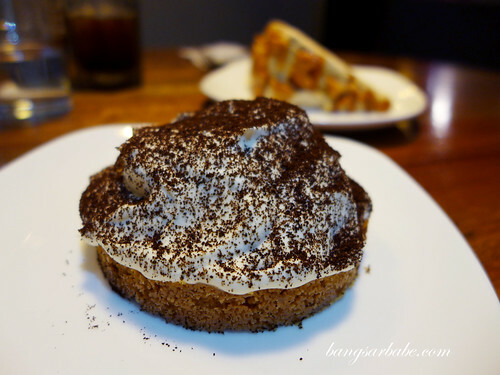 Verdict: Try the banoffee pie and chicken liver pate.